Posted by Ada Wang on 11/20/2018 3:46:57 PM. How do we read Kindle books on Nook? That seems to be an odd question. If you have ever heard of Amazon and BARNES&NOBLE, you will know they are strong competitors in the field of eBooks and both of them not only possess eBook stores but also provide eReaders. So the problem comes to, why do people purchase eReaders from one store and buy books from the other? On one hand, that people choose amazon books as well as Kindle Fire might be due to the fact that amazon has more cheaper eBooks of different categories, including lots of free eBooks. However, we can't ignore that most Kindle books are protected by unique Kindle DRM which makes reading a bit tough. People even can not share their purchased books with others unless removing Kindle DRM. Indeed, Kindle Fire has superb reading experience. On the other hand, people who prefer to B&N and its Nook Color might value B&N's rich library resources. What's more, Nook Color supports EPUB. EPUB is one of the most popular eBook formats while Kindle doesn't support it. Also, Nook Color provides the same reading effects as Kindle Fire. Consequently, people often ask problems like "Can you read Kindle books on a Nook Color?" or "Can you read Nook books on a Kindle?" This article will cover 3 methods to read Kindle books on Nook readers. Here are 3 methods to read Kindle books on Nook eReaders, all of which are solid for all the models of Nook devices, either E-Ink reader or tablet. Method 1: Convert Kindle books to Nook. Step by step on how to read Kindle books on Nook (Nook Color for example). As most Kindle books purchased from amazon are DRM protected, here we remove Kindle DRM firstly. If your books are MOBI format, which is DRM free, please follow second part directly. First: Remove DRM from Kindle eBooks. Step1: Download Kindle DRM Removal and run it. Step2: Add your Kindle eBooks, then drm removed. 1. The Kindle DRM Removal could scan the default save folder of Kindle books automatically. 2. Kindle AZW eBook will be saved as MOBI/AZW3 file when it is unDRMed. 3. 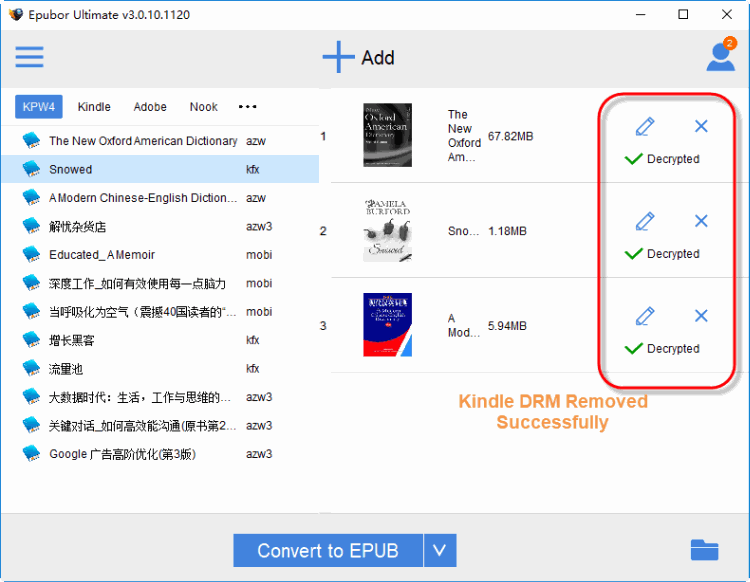 If your Kindle books are not downloaded from Kindle for PC, but saves in your E-Ink Kindle eReader, please connect your Kindle to computer via USB cable. Kindle DRM Removal will detect Kindle device connected and display all the books in the left side column. 1.View KSN on your Kindle Reader: Home > Menu > Device Info > Serial Number. 2.Remove space character from the KSN. 3.The KSN is case sensitive. Second: Convert MOBI/AZW3 to EPUB format. In this step we will use the free online eBook converter. 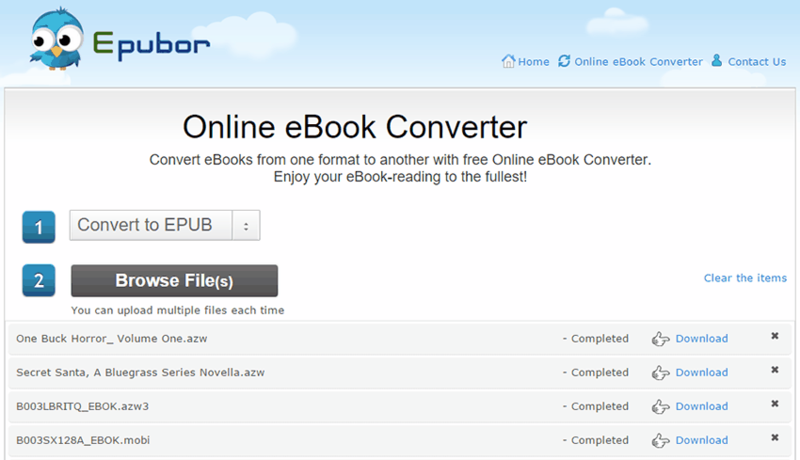 Visit the online converter page, at first you need to choose output format, we choose it as "Convert to EPUB". Then add DRM-free eBooks into the free converter. All the added books will be converted to EPUB automatically, then you just need to click "Download" to get the EPUB books. All the job left is transferring the EPUB books to your Nook eReader or tablet. Now you can read Kindle books on your Nook Color easily and freely. You will have wonderful reading experiences on Nook Color. 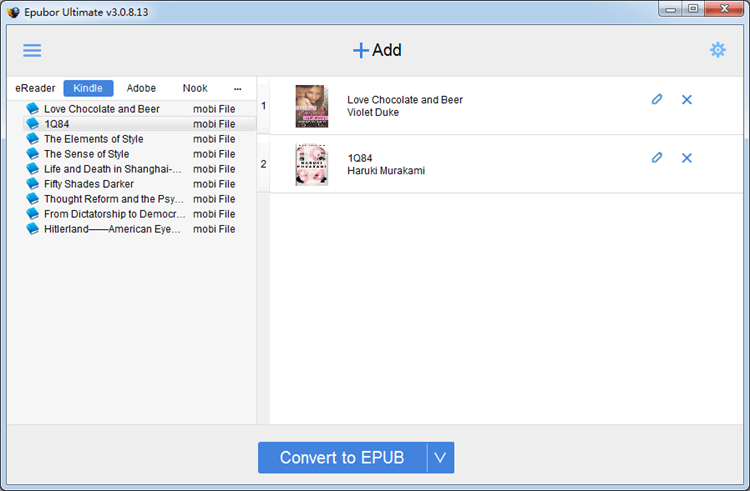 Method 2: Use Epubor Ultimate to convert DRMed Kindle eBooks to EPUB. Epubor Ultimate is a versatile all-in-one converter which combines DRM Removal function and formats conversion function perfectly. The following steps will show you how to proceed. Download, install and launch Epubor Ultimate. Add books into the main window. Select "EPUB" as the output format, set it in the lower left corner. Click "Convert" button at the bottom of the right side of screen and you will see the conversion process in a pop-up window. The save folder of the converted books will automatically pop up when conversion finished. You can also manually open the folder by clicking "Open Folder" button. You can also have a good look at this article Epubor Ultimate user guide. Method 3: Use free Calibre and its plugins to read Kindle books on Nook. If your Kindle books are MOBI format, just use Calibre to convert formats from MOBI to EPUB. Otherwise, you'll have to install Calibre plugins to remove DRM firstly. Here is how to use Calibre DeDRM plugins. Or just purchase an N2A card and use the Kindle app!! Way easier!! I read through the instructions and it mentions being able to read the books on Nook Color once they are reformatted. However, I have the original Nook... will it work as well? My son gave me an Amazon gift card for Christmas thinking I had a kindle. He meant well, but I want to use it for books without buying a kindle. Yes this instruction is solid for all models of Nook. Will I lose any of my other downloads, ie; books from friends, all my books currently on file from ePub, or games previously downloaded? It says things like "If your Kindle books are Mobi formatted..." . How do you know what format your Kindle books are in. I have my Kindle books on Toshiba computers. Do I understand correctly that Nook uses the EPub format? The file extension of the book is the format of your Kindle book. Usually DRM free Kindle books are mobi format. Nook supports both EPUB and PDF format. But for a better reading experience, you'd better choose epub format. If you have a nook table you can go onto the web. Go the the google app store and search the kindle app. Then just down load and buy and read right on your nook with the kindle app. I just did it and works fine. But you have to go on the web and find it. If you just search the shop of your nook you wont find the kindle app. I looks like all these procedures allow you to read Kindle book on the Nook app on a computer. Once you convert the file to a Nook compatible format on you computer, how do you upload it onto a Nook? You can just drag your converted books to the Nook reading app.If you want to read them on your Nook device, you can transfer them to your Nook eReader via USB. HI, i used calibre and could convert the books into epub format. Once i connect (by usb) my nook to my computer (i have a Macbook) i used calibre to send the file to the nook, but it tells me that there is a communication problem to connect with the nook. Can you help me please? Easy, just copy the epub book to the Nook drive. Thanks for all your effort on this website. Gloria loves getting into research and it's really easy to understand why. We learn all regarding the dynamic form you convey practical solutions on the web blog and in addition invigorate response from website visitors on this matter plus our own girl has always been learning a whole lot. Take pleasure in the rest of the year. Your carrying out a really good job. Thank you! We are glad to know that you like our articles. We will keep working hard to find good tips and tricks. So this is a trick to get people to download software they don't need. You can download it for free and it does decrypt the files but it will only give you 20% of the book unless you register the software and to do that you have to pay $27.00 so it's not really free is it. You are using the trial version. It will decrypt and convert 20% content of each book. Solution 1: Buy the full version. Solution 2: Ask for customer support team to ask for temporary license. Solution 3: Contact editor team to help translation the software or one article in exchange of a free license .